One last night in the mountains, Mount Kinabalu National Park on the way back to KK. For the first time there was no need for fans or Air conditioners and the rain in the evening was torrential. 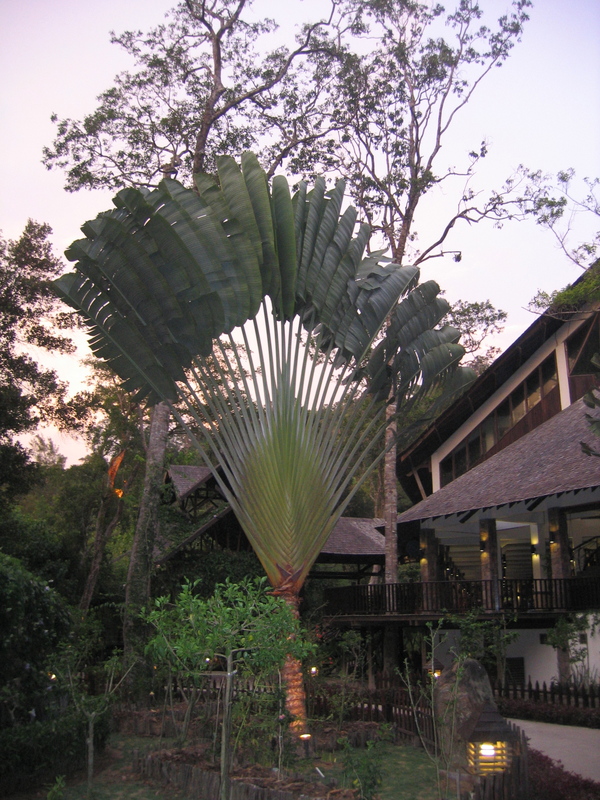 Staying again in a lodge on the edge of the jungle the bird life and moths and butterflies were amazing. Back in KK the walk along the edge of the sea was as always beautiful, the sea sparkling and the islands offshore where we were heading next. There are always lots of Egrets along the edges of the sea here but I don;t think I have seen any seagulls at all. 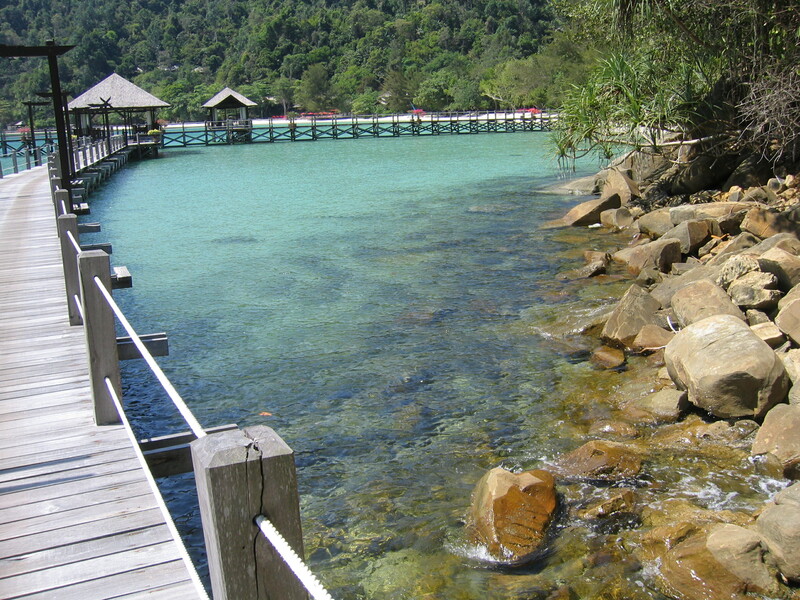 No crocodiles here on wednesday as we set off from Jesselton Pier. Steamy hot again but it was cooler on the water. From the shore Gaya Island looks quite near but it took quite a while to get there. 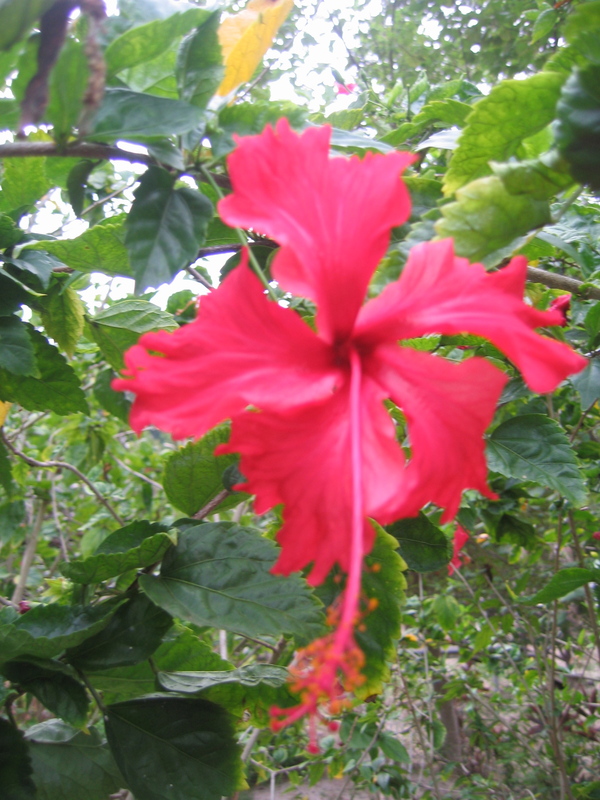 The island is beautiful, a real paradise island, home to various sorts of Hornbills and between fifty and sixty different varieties of Hibiscus amongst other things. Planning a Hibiscus garden for when I get back to the UK! There were pairs of hornbills flying around the jetty when we arrived and in the late evening wild boar were roaming along the beach and spent most of the night under the cabin! They are huge about the size of a calf with long legs! 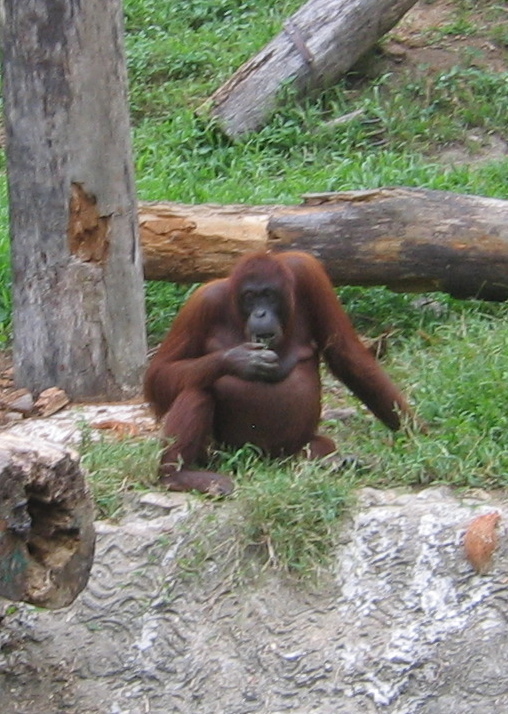 All the monkeys seemed to live in family groups and you could see adult females passing babies between them. 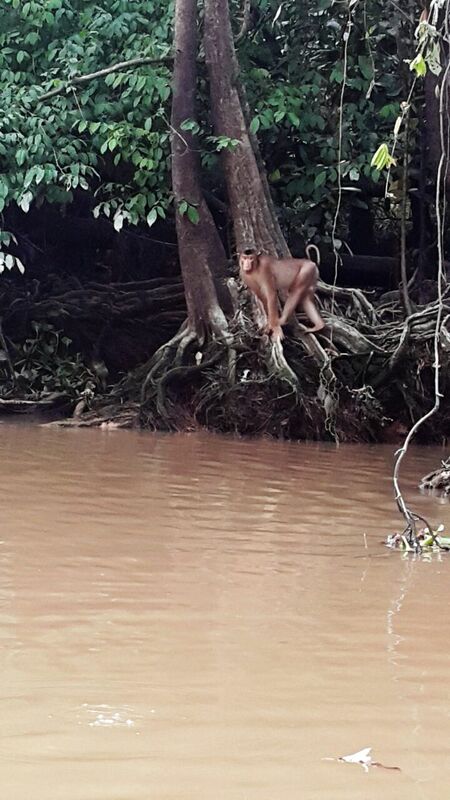 Pig tailed Macaques littered the waters edge. One seemed to badly injured, maybe a male who had fought and lost control of his family of females. Beautiful elegant white Egrets were everywhere lining the shoreside and we saw a purple heron flying above us. The rooms were in log cabins up flights of stairs and a owl sat on the steps each evening eating beetles and insects. 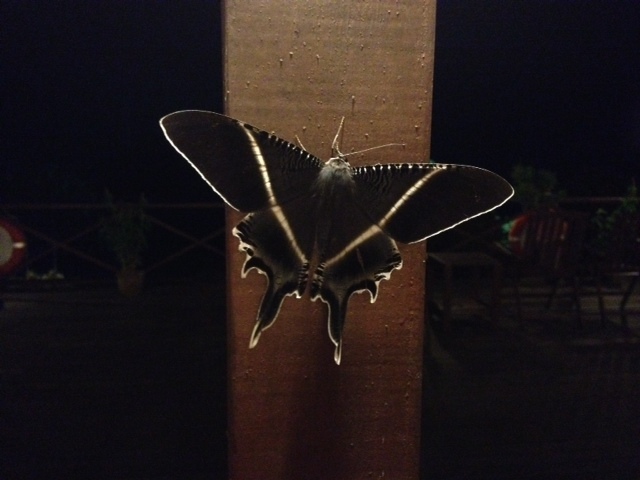 Huge moths and bats flew around the open air restaurant. And in the mornings I was woken by young Macaques play fighting on the roof and chattering on the walkway outside the door. The second day we were there we got up really early and were on the river by 6.30am. It was light but already heating up. There were different birds around at this time of day. Including a Fish Eagle and Hornbills. On the way down the river there was a crocodile in the water raising its head to bite at a black plastic bin bag of fishing bait. Impressive sound! 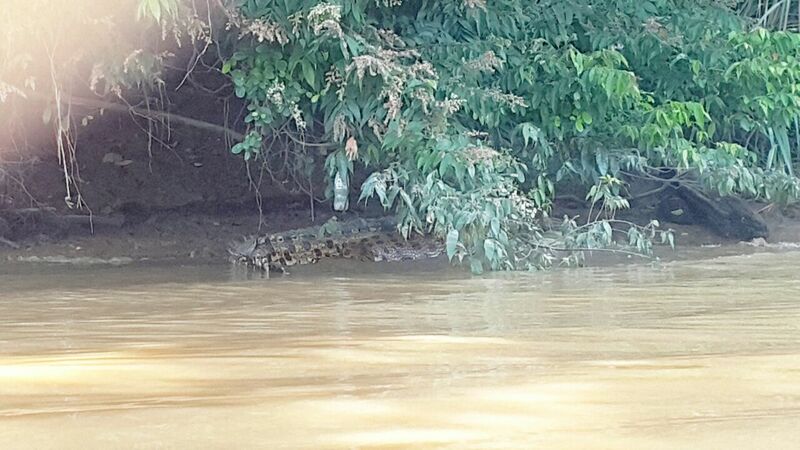 On the way back the boatman took us in close to the bank where a crocodile was having a post-prandial snooze, before it registered the attention it was getting and and lowered itself into the water and swam off quite slowly. It was huge, amazing to see all of it and wonderful to watch such a big creature submerge itself like a submarine with barely a ripple. Hands strictly inside the boat at this point! Further up the river along with several other boats we were able to observe an Orangutan high up in the forest canopy. 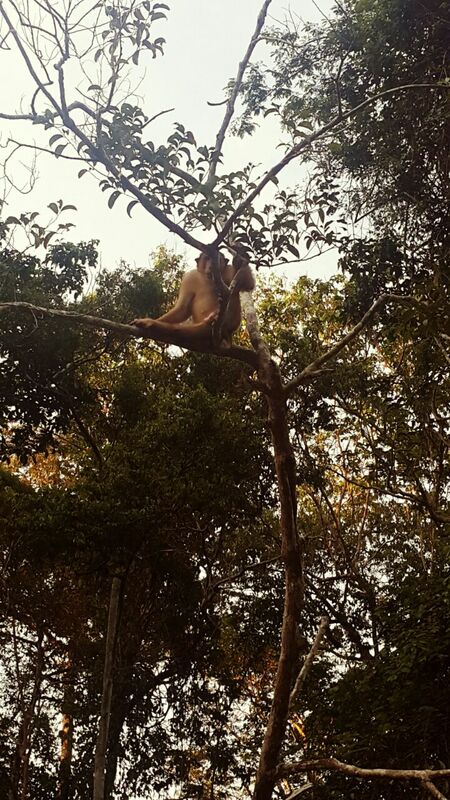 Amazing that a monkey of that size does not just break the branches. I watched a beautiful butterfly, white with dark dots and strangely shaped wings. It just floated around like a piece of tissue paper being blown by a soft breeze. After a late breakfast we took a walk into the jungle. The birds were dozy but there were beautiful butterflies again. A smallish brown one with blue around the bottom edges and a largish brown one with white spots. Out guide pointed out a couple of Orangutan nests high in the trees but no monkeys to be seen. It was hot and humid – totally draining. From the top of the observation tower there was a view out over the river revealing it in all its meandering majesty. There had been no sense of how near it was to being an ox-bow lake when we had been on the water. Almost at the end of the trail there was a tree of vast circumference but dead and hollow now. We crawled inside it and saw bats roosting high up. Apparently during the second world war villagers used to hide in there. After lunch there was another river trip. There were more macaques and proboscis monkeys and two monitor lizards blending themselves in so efficiently with the trunk of a dead tree that it was amazing that the guide spotted them. They watched us watching them fro a while and then sure of their camouflage they went back to sleep. Between two and three feet long and much more reptilian they make the lizards we seen in France seem very insignificant. A group of macaques with lots of babies were at the waters edge. The young ones were playing and chasing each other. One really tiny one with a large black head, I assume because it was so young, kept trying to climb a tree and almost falling. Its mother or another adult female was keeping a close eye on it and at one stage positioned itself so the baby could walk across her back to safety. There was a stork billed Kingfisher too who obligingly sat on a branch, quite still, before taking off in a typical straight as an arrow flight. 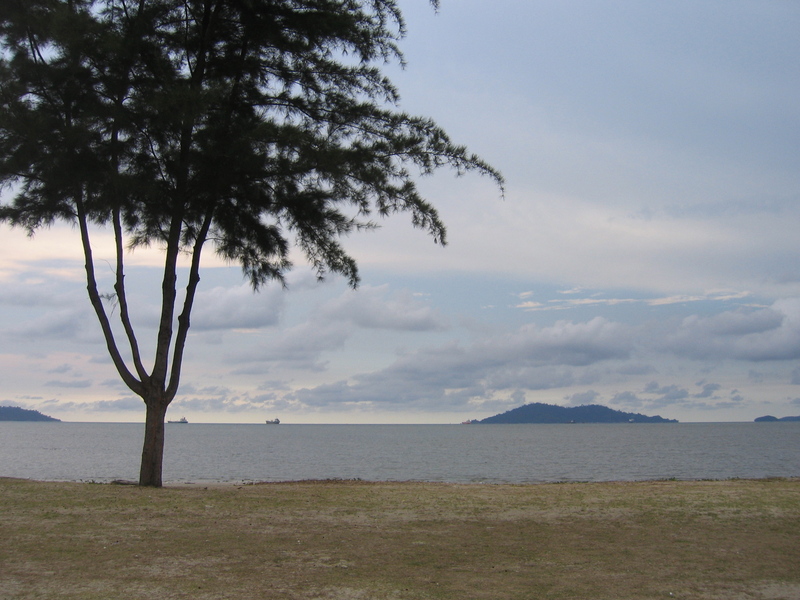 Sunday afternoon we went to the Kota Kinabalu Wetlands. Wooden walkways thread through the Mangrove swamps where there are lots of birds and other creatures. 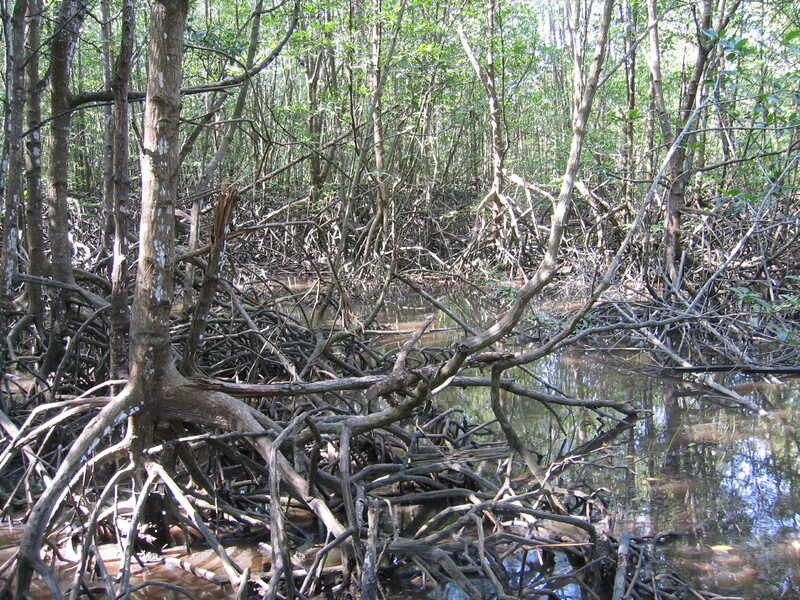 The Mangrove trees are extraordinary, primeval structures with strange visible roots like spiders’ legs with bulbous knees. The swamps are tidal and as you walk around, it was absolutely deserted; strange cracking sounds come from all directions making it very eerie. They are noises made by the crabs. The time of day meant that the birds were quiet but we did see three different sorts of white egret. 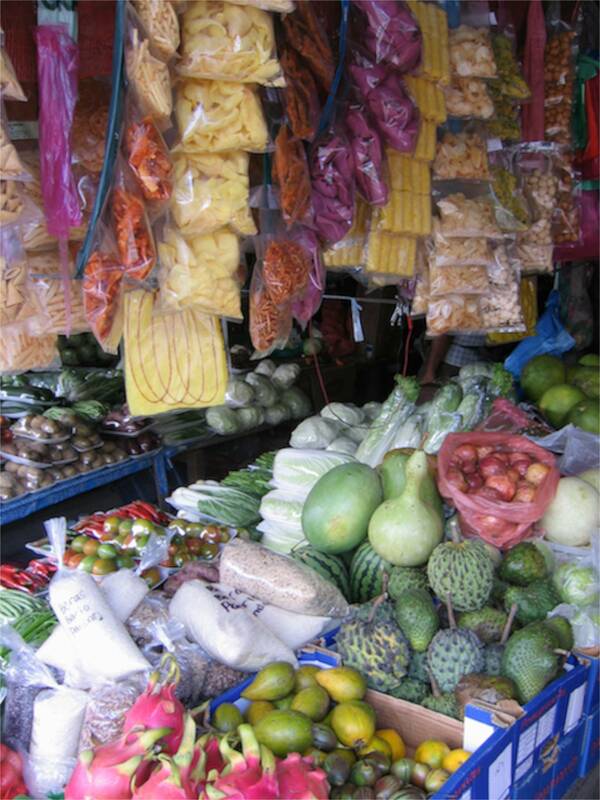 The heat was searing and it was very humid. We spent Monday at Lok Kawi wildlife park. I am not a fan of zoos but this is rescue centre rather than a display of animals and many of the creatures like Sun Bears, who were very unhappy and Orangutans which were very happy, are there because their habitat is being destroyed and they are an endangered species.They are rescued and then relocated. We watched a beautiful Kingfisher for a long time in the trees teetering on the edge of a branch as if about to dive. In the end it didn’t. It was bright orange and blue. 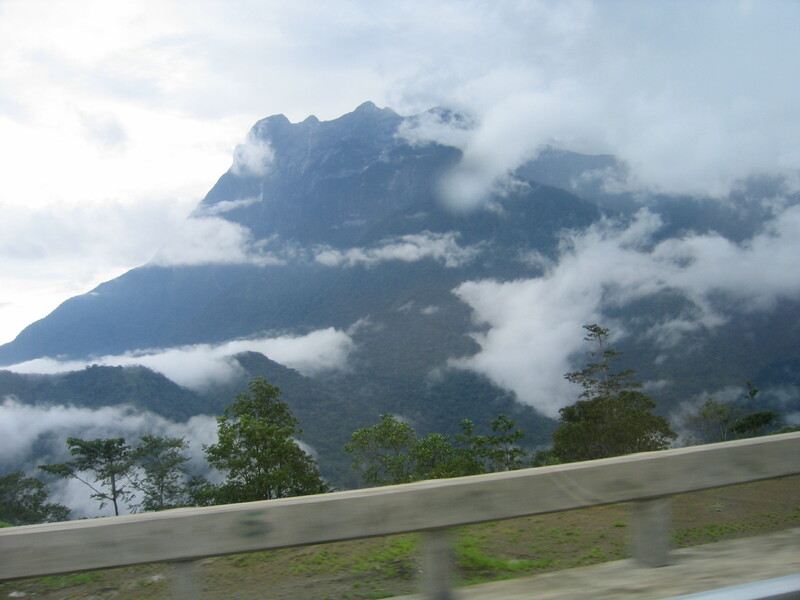 Drove back into the mountains but past Mount Kinabalu which was looking amazing. Sharp jagged edges of of rock emerging from the clouds reaching upwards. 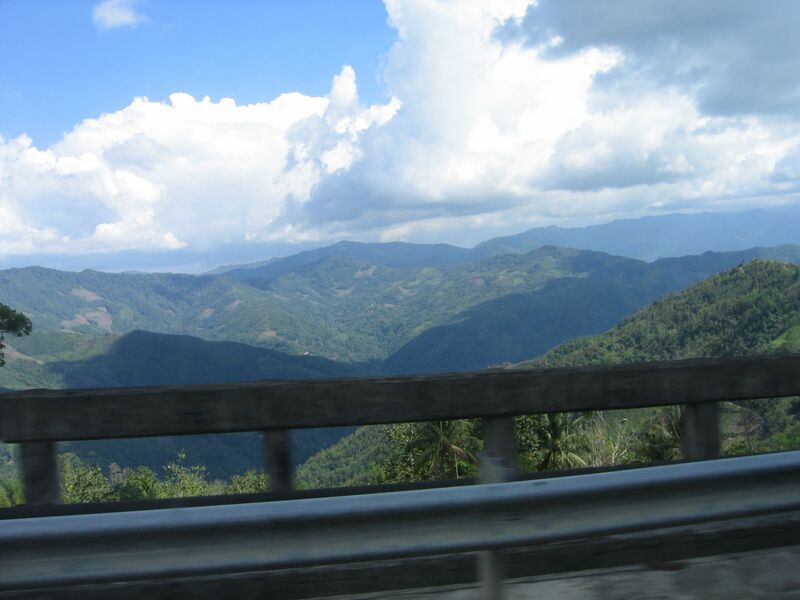 We finally reached the Sabah Tea Plantation, driving up a pitted unmade road whoch shook every bone in my body. 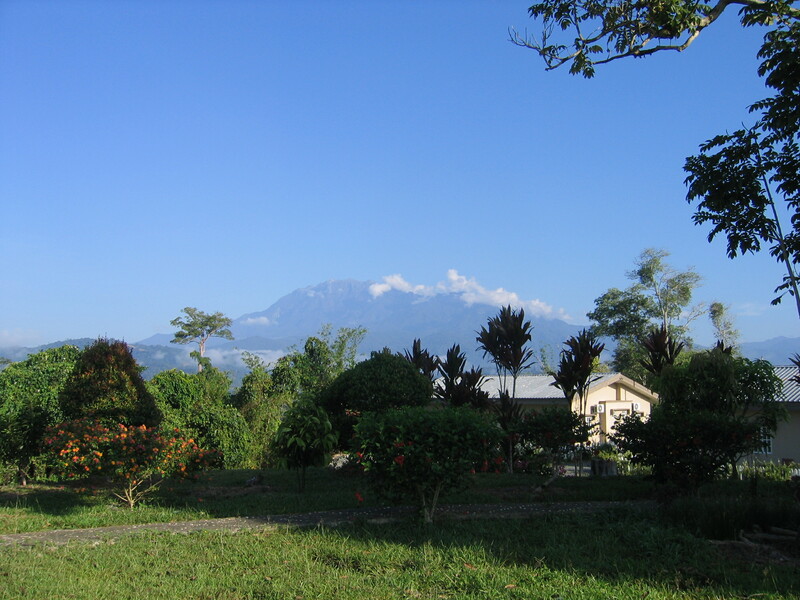 The restaurant looked out over the most phenomenal view of Mount Kinabalu and its foothills. I passed up the chance of sleeping in a traditional longhouse, a traditional long bamboo dwelling with rooms to one side and a long communal corridor on the other, in favour of a cottage. – very unadventurous. What with the noise of the fan and the air condioner and an in house gecko chicking its tapping sound all night I didn’t sleep very well, but the view in the morning was breathtaking. The clouds hiding the mountain disappeared for a short time and you could see all the jaggedness of the range. Friday we drove towards Sandarkan, atrocious roads, atrocious driving and mile after mile of palm oil plantations which are destroying the habitats of orangutangs, sun bears, and birds and insects of all descriptions. Torrential rain hit the car like a wall of water, carpeting the road and disappearing into the deep storm drains at the sides of the road. 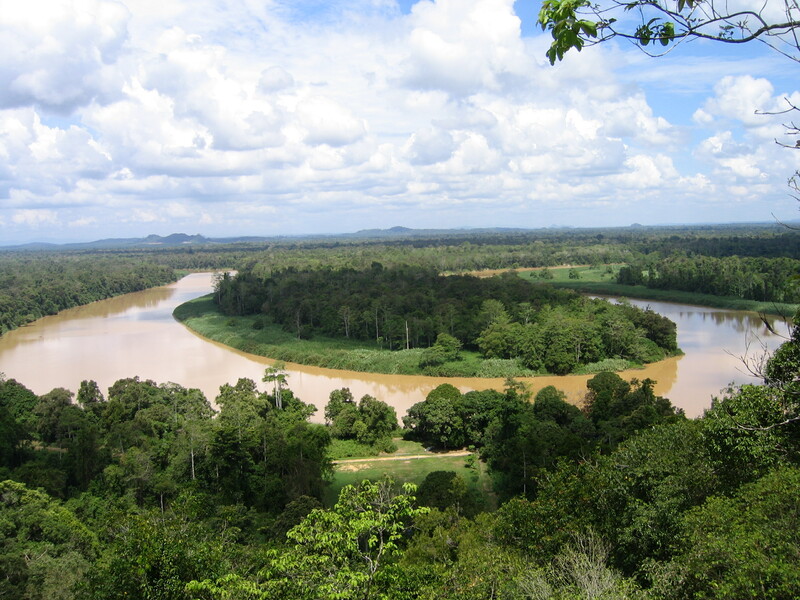 We finally arrived at Myne Resort on the Kinabatangan River, a wide flat muddy brown expanse of water meandering through the heart of the jungle. Late afternoon we went out on the river in a small launch and headed down river. 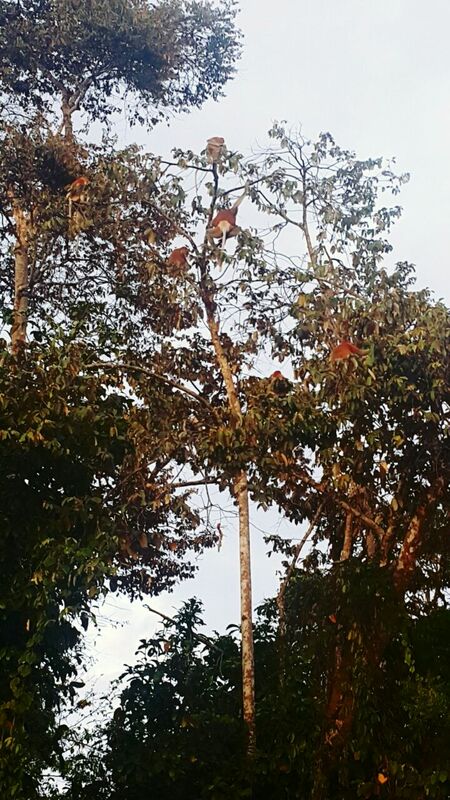 We stopped frequently to watch monkeys. The first were very pretty Silver Leaf Monkeys and then Long Tailed Macaques and Pig Tailed Macaques. There were lots of baby ones leaping about in the trees and playing like kittens. There were family groups of proboscis monkeys too with their huge noses especially the dominant male. One baby grabbed hold of the long white tail of an adult to steady itself! 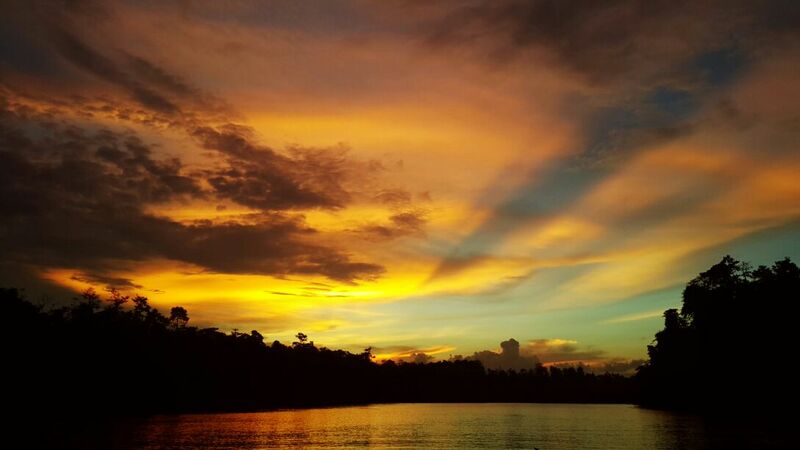 Coming back up the Kinabatangan river at sunset. 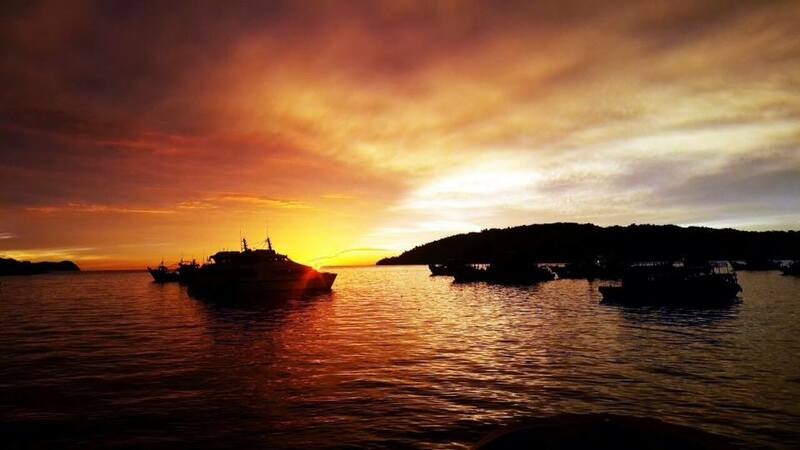 Kota Kinabalu – the waterfront at sundown. Eleven hours from London to Hong Kong. Landing at the airport we came down with water on one side, really close to the sea. From the airport you could see lots of small fishing boats dancing on the water. 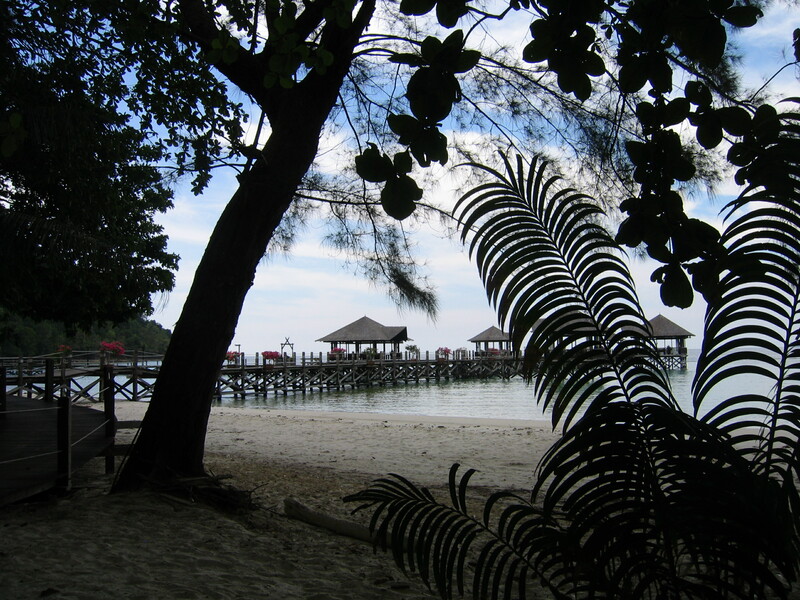 A quick change and then – three more hours – to Kota Kinabalu. The heat hit me as I emerged from the airport and the verdant green of trees in full foliage, were a contrast to the still wintry trees in London. In the evening we went down to the waterfront for dinner and stood and watched as a huge red sun dipped quickly below the horizon, as if being swallowed by the sea, leaving the landscape suffused with an orange red glow. 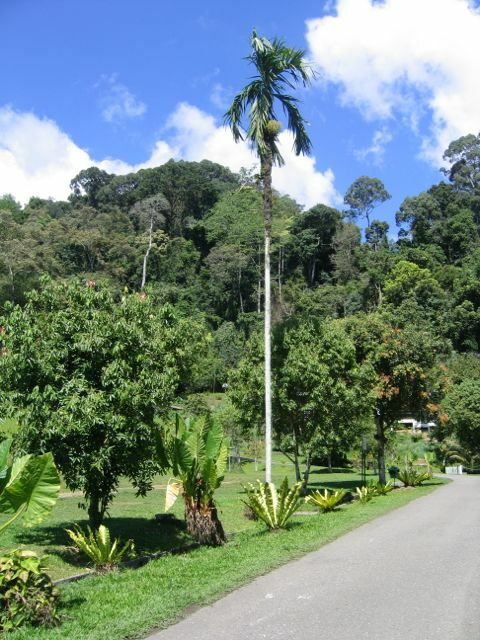 The next day we drove up through the hills towards Mount Kinabalu and then on to Poring Hot Springs. The hills were coated in scrubby greenness, with coconut palm trees everywhere. The roads were steep with constant hairpin bends and there were rare three lane sections where you could overtake slow lorries and buses. Progress was tortuous. Dogs wandered freely everywhere many of them strays. 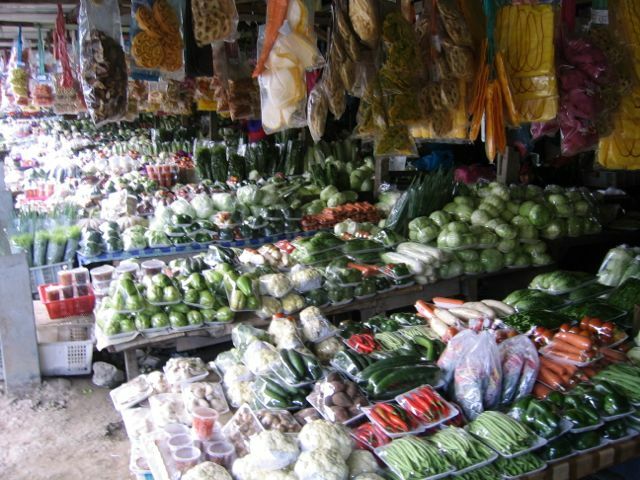 Shack-like open stalls lined the roadside selling all sorts of interesting beautiful fruits and vegetables and bags of snacks hanging from wooden beams, from honey coated sweet potato to deep fried spinach leaves. Many of the houses we passed were square clapboard dwellings on stilts with staircases going up the outside. Some were smart and painted soft pastel colours with columns, almost Palladian on a small scale. Others were tumble-down with corrugated roofs and patched and crumbling wooden walls. We had rented a villa in Poring Hot Springs and the view out towards the mountains was spectacular. Tiny ants scurried around the sinks and geckos ran around the edges of the ceilings. They eat spiders and flies so are definitely desirable house guests. I spotted a baby one climbing into one of our bags but we couldn’t find it in there when we were leaving so presumably it climbed out again before we left! We ate in the Restaurant in the evening surrounded by annoying flying ants and large bats looping backwards and forwards just above our heads. As we were leaving a huge stag beetle flew into one of the lamps and stunned itself, it was as big as my hand! Amongst Malevich’s early paintings in the Tate show there are delightful little ink and watercolour paintings of houses, Flaneurs and boats. Known primarily for his Black Square this exhibition is a revelation. His early work seems to be an eclectic mix of styles revealing influences of Matisse, Lautrec and other French painters, a touch of Pointillism and Bather 1911 has suggestions of the Fauves in its vibrant colours. And Fernand Leger in the The Scyther. Rooms two and three take you on a fascinating journey through cubism with Russian roots and rural subjects to Marinetti’s Futurism. Morning in the Village after snowstorm is a lyrical soft edged face of cubism, with swirling snow drifts and a sea of houses, figures with elongated shadows on a pale ground. 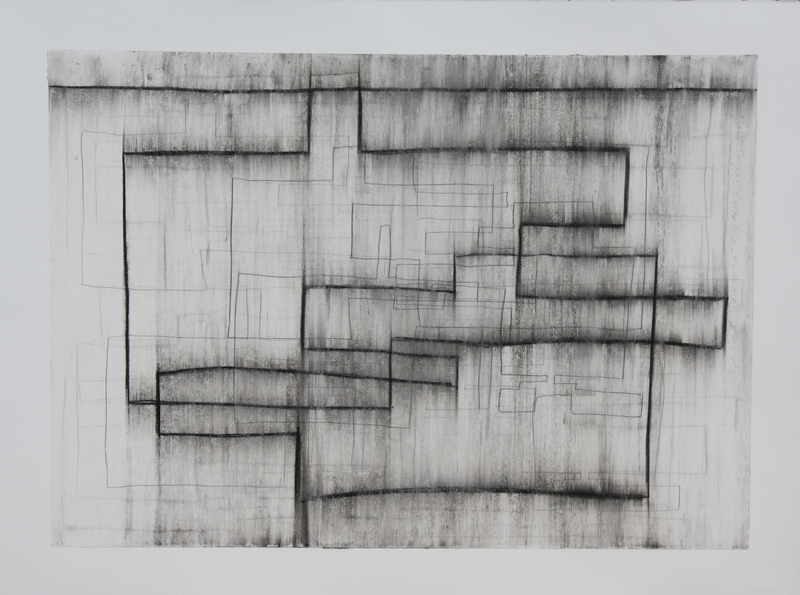 The drawings too are magical, lovely complex tiny cubist works in pencil on paper. Small because apparently paper was very expensive in Russia at that time. And so the the Black Square 2015 with its still heart-stopping white which is very beautiful, Lead White I wonder, and its now craquelured central black square with its tiny webs of lines, wrinkles on a much loved ancient face. Then the tumbling fat lines and straight edged shapes of the Suprematist work, still vibrant colours and occasional curves and circles. 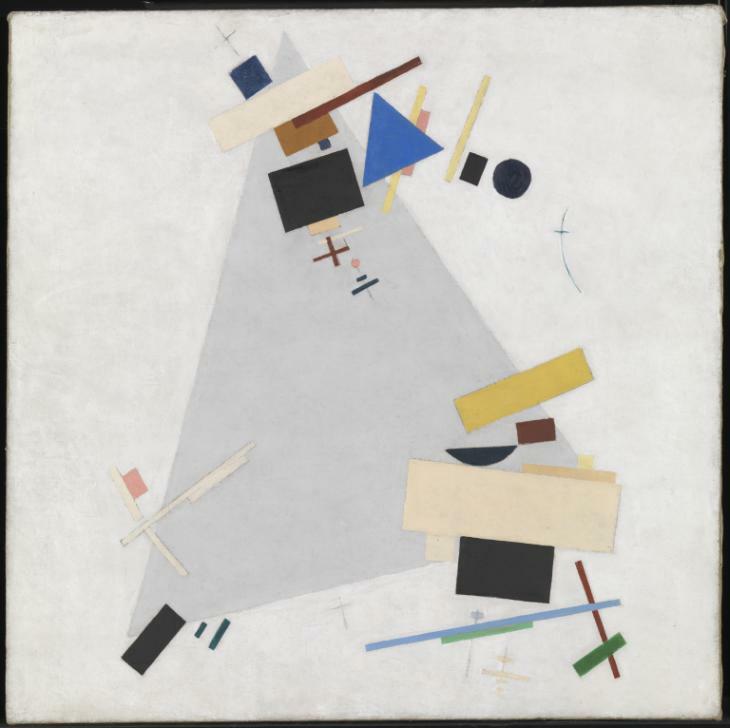 Dynamic Suprematism / Supremus 1916 – 17, which I loved had a wonderful sense of stillness despite the slashing, destabilising diagonals and detached, leaning, falling shapes and strips. The pale dissolution paintings in room eight, labelled the End of Painting are very beautiful, light and edge dissolving, folding in on itself and disappearing, soft-edged and fading into a state of non-existence. Room ten contained drawing after drawing, some of them studies for paintings. In the little cubist Horse Drawn Carriage in Motion, 1913, you can see the wheels rotating and in Suprematist Construction no. 118, 1920, the weave of the paper shows through the crayon in a way similar to the slub of the canvas showing though the whites on some of the white on white dissolving paintings. The final paintings are poignant and have references to Renaissance painting. The Portrait of Nicolai Punin was reminiscent of Bellini. Signing these works with a small black square it is obvious that he was still rebelling against the need to make paintings which were not seen as decadent. Small and symbolic in these last works his black square was destined to become both mythic iconic in its future. 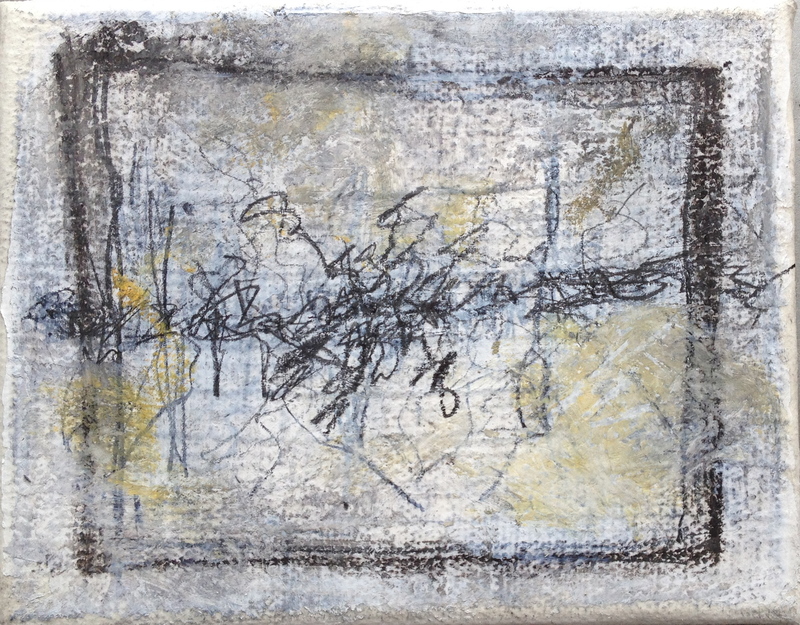 A bit of paper some conté, pencil and a few smudges of acrylic and finally after three months out of action I have managed to do a tiny little drawing. Feels so good to be in the studio. 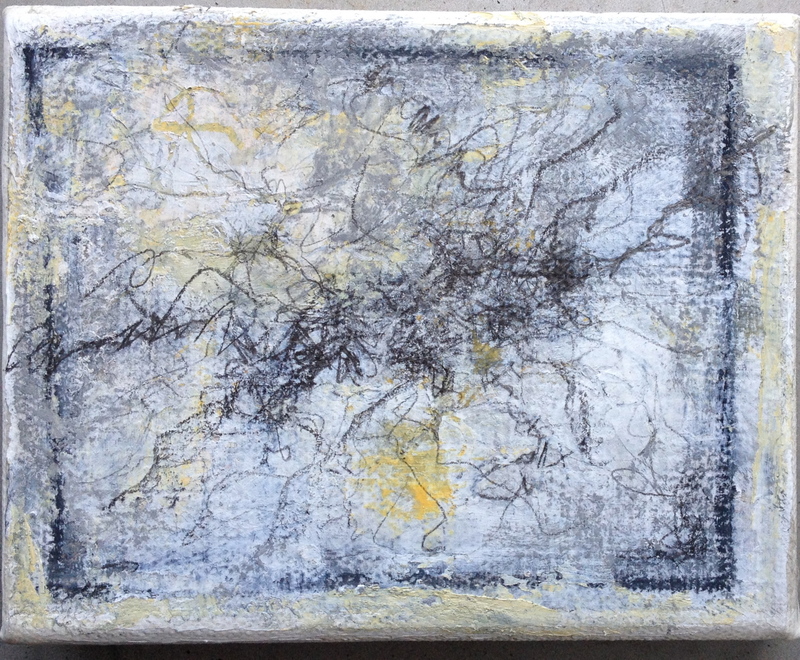 Based on sketchbook drawings of the pavements in Ballycastle and the beach at Ballinskelligs. Might put it into the Power of the sea Café show at the RWA or might just sit and look at it and try and do some more over the next few days. Well the show opened spectacularly at Jean Luc Baroni in Masons Yard on Monday on a warm balmy June evening, at last it seemed like Summer had arrived. All six artists were there and the gallery was packed so people were spilling out into the courtyard outside. There is a lot of work on show but is is cleverly hung so there is plenty of space around it and Novella Baroni and Flavio Gianassi, the curators, have hung work by the different artists alongside each other, making connections and highlighting the way the drawing and sculpture work together. 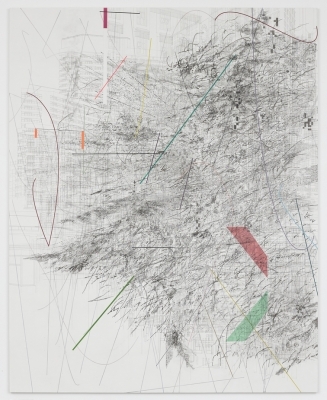 The following day I went to the Julie Mehretu exhibition at White Cube in Bermondsey. The space with its huge rooms and high ceilings is like a cathedral, a temple to art. Mehretu”s canvases are vast, intricate, detailed but with flowing drifts of wonderfully free marks in ink. A mixture of control and movement. Brilliant exhibition!